One of the best pics of Lance from this trip to San Jose. Midget Gold - The KIHA Warriors continued to make an impact in our tournament, as they faced the NCR Tour Elite in another battle for the gold. #95 Danny Higa, fresh off his top scoring run from Bantam, opened up the scoring in this game, when #7 Brenton Ratley found him for a nice goal late in the first period. It was a good feeling for the Elite, as KIHA goalie Donovan Warren had been haunting them all day. The first period would end with the Elite leading 1-0. In the second, KIHA goalie, Warren remembered that he doesn’t like to give up goals in the championship, so he shut it down. Meanwhile the KIHA offense started to percolate a little bit midway through the frame. #21 Trentin Gillis would break the KIHA scoring drought, when he scored his unassisted goal. 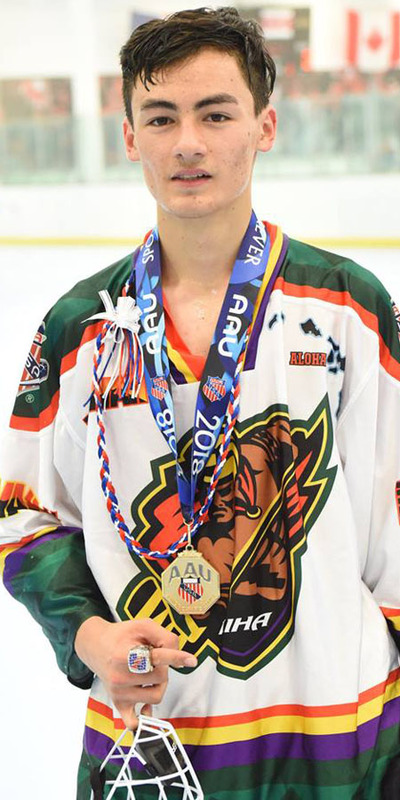 It would be another quick mental lapse for the Elite, as they allowed #26 Preston Suekawa to chip the faceoff forward to a speedy #7 Sam Eisenhower, who scooped it up and scored the second KIHA goal in 15 seconds. That is all that the KIHA kids would need, as Warren battoned down the hatches. The Elite would not score again, and they would watch as the Warriors hoisted another cup in their midst.